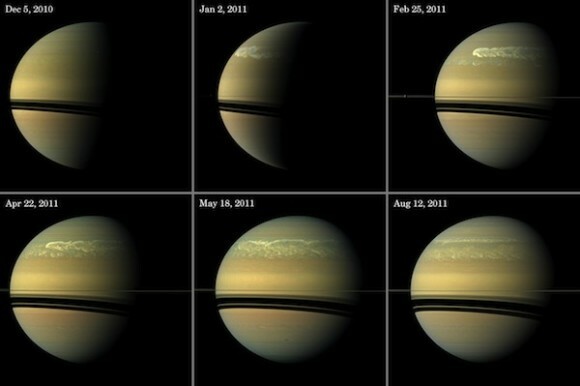 Cassini spacecraft images show the development of the largest storm seen on the planet since 1990. On Saturn, not only are storms much bigger than on Earth, they’re far more violent, with vertical winds of more than 300 miles per hour. After arriving at Cairns on the Monday night, we rose early on Tuesday morning to view the eastern horizon from our hotel room. We had specially booked this room with the intention of setting up our cameras on the balcony and waiting in comfort for the eclipse to unfold. Before sunrise, the dark sky reveal only a few stars directly overhead. To the east a mountain stood between us and the sun. Although not an ideal location, the determined altitude of the sun at totality being 14 degrees would theoretically place the sun above the crest of the small volcanic landscape. The unpredictable and threatening aspect of the setting was the cloud cover that hung perpetually over the hills. As the sun began to rise we were not able to find its position due to being completely blanketed by black stormy clouds. A small gap appeared intermittently allowing sun beams to radiate onto the buildings along the wharf. As part of our contingency plan, we had a day before the eclipse to research the weather conditions and possible alternative locations. Some associates and friends that we had dined with the previous night elected to seek out a location near their accommodation. They decided on Trinity Beach being twenty kilometres north of Cairns CBD it provided good veiw of the ocean and was not far from their caravan park. The only problem was it was one of the popular locations for film crews and organised groups to assemble. These suburban locales were closed off to traffic an hour before totality so as to limit the traffic into the area. We thought more options would make themselves known once we drove further north. Having the whole day ahead of us, we journeyed north along the Captain Cook Highway, passing Palm Cove and Port Douglas along a stretch of road that closely passes the ocean beaches with their mixture of sedimentary sandstone and igneous granite rock facings. We found a number of good possibilities with good parking close to the beach and clear easterly views of the ocean. Stopping at a few of these locations, we checked our bearings with our smart phone compass and declared this area to be our best option for the eclipse morning. The rest of the day was filled with visits to the Daintree Discovery Centre and a drive to the furthest northern point on the sealed road at Cape Tribulation. On our return trip we scouted for any better locations considering Port Douglas as an alternative choice as the centre line of the shadow was some where south of this bustling tourist town. Not wanting to be forced to find parking at shared beaches, we revisited the place we had selected on the way up. Ellis Beach is 7 kilomtres north of Trinity Beach and Yorkey’s Knob and a few kilometres north of Palm Cove. This long expanse of coastal beach provided numerous vantage points with plenty of space for the potential hundreds of visitors that were do the same as we were. Many people were already setting up camps along the road, claiming their position as the afternoon went on. After returning to our hotel and balcony, the cloud was still hanging over the east so our minds were set to leave early the next morning and head north. At 4 am on Wednesday 14th November 2012, we prepared for our journey; having breakfast, gathering tripods and cameras, then packing our hire car we left for the north coast. Arriving at Ellis Beach around 5 am, there were a large crowd already gathered on the beach. We picked our spot before the sun was above the horizon and set up the cameras. To our dismay there was a thick band of cloud settled above the ocean. Next to us were a couple of Frenchmen along side a family of Ukrainians now living in Melbourne. Brent, a local plaster sat beside us with his cross German Shepard and Stafford-shire Terrier wondering what the fuss was all about. The sky began to lighten revealing a bank of low cloud along the ocean horizon. We estimated the point where the sun would rise a little east off the point as the beach faced a more northerly direction. The glow in the horizon surprised us a little to find the rising sun closer to the point than we expected. Nevertheless we still had a perfect view of the sunrise as it broached the horizon like a golden fire spreading across the eastern sky. A scattering of cloud provided a beautiful contrast with the only exception that these cloud were moving into crowd out our sun. At this point we had some concern that the cloud cover was increasing in magnitude inhibiting any vision of the first contact of the sun and moon at 5:44 am. We would miss the beginning of the eclipse process where the moon slowly passes in front of the sun blocking its face and creating a diminishing crescent shape in its passing. This was not such an important issue as there was forty minutes left until second contact begins. A few mobile phone calls to our colleges at Trinity Beach confirmed that they were experiencing the same cloud cover. With twenty minutes to go the sky was patchy with cloud and there was a chance that the sun would not reveal itself in time. To the north towards Port Douglas, the sky appeared to be clearer but the percentage of cloud was 50% as was the sky east of our beach. There was no point changing locations at this late stage and we sat tight waiting with baited breath as the clock countered down towards the predetermined moment. Within a minute of the totality, the clouds opened up to reveal the final stage of the first event. A crescent shaped sun appeared through a window in the cloud. the excitement along the beach could be heard as a synchronized sigh of relief was released and anxiety levels percolated into a feeling of joyful resound. The encroaching shadow was darkening the early morning sun creating an iridescent purple glow to the sky. The temperature dropped a few degrees and the atmosphere retained an eeriness reminiscent of medieval tales of witchcraft and sorcery. The cloud parted ways within a minute of the moon’s enclosure of the suns surface as the sky darken into twilight making it difficult to read the settings on my camera. Alas I had forgotten to bring a red light torch so I was forced to make guess work of my desired settings. At this point I was taking photographs with my Canon D40 camera via a 2x extender and a Canon 100 to 400mm EF zoom 77mm lens giving me a 800mm telephoto view of the sun through a white light filter. Quickly removing the filter seconds before the second contact began there was time to capture the final 30 seconds of teh sun before totality. The cameras aperture struggled to process the shots with the quickly changing light levels. A voice behind us countered down the moment, 5..4..3..2..1..A cheers went out along the entire beach. The moon engaged the sun by completely covering its face to reveal a blazing corona. The halo of light sparkled and danced around the edge of the moon as people stood in awe of this pnenominia ong the coast. Cameras clicked and flashes erupted as hundreds of cameras attempted to capture the experience. Birds that normally would have been actively foraging, nestled themselves chirping and calling their mates to roost. For two minutes the shadow remained on the beach holding the focus of its occupants skyward. My view of the eclipse through the eyepiece of my camera enhanced the solar flares and prominences with their rich red coloured projections extending thousands of kilometres beyond the surface of the chromosphere. Not needing any filtered protection to view this event, observers studied the suns corona and its extended solar winds with the naked eye now visible around the edge of the moon. Two minutes passed quickly as the moon moved away and the sun returned to shine beyond the edge of the luna satellite. The curve of the moon allows a flash of sun beams to sparkle beyond is surface, bending around the edge of its crators creating an effect known as the Diamond Ring. The glowing pinch of light begins to spread across the lunar circumference quickly growing in intensity until it becomes too bright to view with the naked eye. The third stage of the eclipse begins as the moon moves away and the crescent shape of the sun reappears and increases over the next 40 minutes. Brent, our local plasterer is beside himself having experienced what he discrbes as a biblical event that for many will be the first and only time they will see it in their life. He was so pleased he had decided to come out to witness this before work, stopping on what would normally be a quiet and secluded beach scape on the side of the highway. Making a phone call to our friends at Trinity Beach to share the experience, we discovered that they had not seen any of the totality due to the persistent cloud cover. It was almost impossible to imagine that seven kilometres south, the cloud could be so different to where we had been positioned. Within a few minutes a car pulled up and an American tourist from Arizona stepped out to see how our viewing had worked out. He explained that he had passed out position twenty minutes earlier and decided to travel a few kilometres north where he thought the cloud was thinner. They had missed the beginning of the first stage as we had but also missed part of the second stage as the cloud cleared for them just after the totality began. As the crowd dispersed we logged our observations on Facebook and emailed members at home before we packed our cameras and tripods away. We drove north to Port Douglas in search of a shop for morning tea and spoke to a couple from the Netherlands who had rendezvoused on the northern end of Port Douglas Beach. Apparently the cloud cover there was almost as bad as Trinity Beach only seeing the last half of totality. Another passer by said he was at the southern end of the beach and had 100% advisability of the event. No matter how much research and good preparation you may do before hand, there is always a risk of failure when choosing a place to observe an eclipse. Of all the places we had available to chose, we were just lucky to pick a spot that provided the clear skies at the right time. This event only occurs because the size of the moon is exactly the same apparent size of the sun. Such a coincidental ratio of star and satellite possibly never occurs anywhere else in the universe. We consider ourselves fortnate and lucky to be have witnessed this event for the third time and hope it won’t be out last. THERE IS GOING TO BE A TRANSIT OF VENUS ON JUNE 6TH! IT WILL NOT HAPPEN AGAIN FOR 105 YEARS! publication prior to this celestial wonder so you need to be prepared. For night- time observers, on other pages in the magazine I have reprinted – with kind permission of Geoff Smith, Observations Officer of the ASNSW, an observing list he published for the South Pacific Star Party. The list is entirely relevant to our sky for the next month or so, bearing in mind that the time advances by two hours per month (completing a full circuit in a year) and the area of sky will move 15 degrees further west than at the same time last month. Jupiter is moving completely behind the Sun from the Earth and as such is no longer a viable target. Mars of course is easy to find near Regulus in Leo and for all its’ tiny apparent diameter is shining like a bright ruby at mag. 0.2. Saturn has also passed opposition and is in our northern sky throughout the night. It is imperative that we take advantage of the steady seeing and dustless skies to view the celestial beauty of this gas giant, we had to wait six months as we will now have to await the return of Jupiter. Venus is moving in front of the Sun next month! The Transit of Venus on 6th June is perfectly timed for Eastern Australia and we get to see the whole event as it lasts 6½ hours. This means that even should cloud obscure our view the chances are we will see at least some part of the event. We have had a brief outline of the historical significance at an earlier meeting but it is personally significant to all of us as we will never see it again (I would have to live until I was 159 years old! Jack will be 187!) Anyone who doesn’t catch a glimpse this time will not see it ever, nor will 95% of people born this year. If astronomers had a way of measuring one such distance accurately, the distances to all the planets could readily be calculated. Once the distances were known, the planets apparent size (angular) could be measured and the actual size could be calculated. Once the actual size of a planet was known, the orbits of that planets’ moons could give us the true mass of the planet. Astronomers were taking tentative steps on the second stage of measuring the local universe. But most importantly, if the true Earth – Sun distance could be calculated, we could begin to measure, using parallax, the distance to the nearest stars! Parallax is the apparent shift in an objects position when viewed from different angles. In its’ simplest form our paired eyes use parallax to gauge the distance of objects we view. In astronomical terms it was seen as a means to measure the distance to the nearest stars. If an object was observed at six month intervals to move against the background of distant stars the angle could be calculated and the distance extrapolated. The baseline of the triangle would be the diameter of the orbit of Earth or twice the Earth-Sun distance. poor optics, that affected the precise recording of the ingress and egress time that was essential to the parallax measure. Nevertheless, when all the data was collated and calculations were made, the results gave a figure within 3% of the distance known today! photographed by individuals. A music stand to hold your target screen would be useful. objective end of the scope! IN PLACE. If you project the Sun image remember that unprotected sunlight will heat the inside of any scope tube in minutes, will melt any adhesives between lenses, ruin eyepieces and burn anything in its way. If your eye gets burned, you will be blinded. the occasion, i.e. the equipment, other viewers and friends, and the location. These will be your lasting memories. There will be thousands of photographs taken that will be better than yours so ABOVE ALL, DON’T WORRY, enjoy the occasion and the spectacle. You will be playing a small part in the history of astronomical observing. I will be observing first and second contact from my observatory in Kangaroo Valley and then going to the KV Showground at 10 am to show interested locals. After that it’s off to a local High School so feel free to contact me if you want to join in. The speaker began study of the sun in H-alpha on June 23, 2001. Within minutes the filter revealed prominences and surface filaments; then a small but brilliant flare erupted. It was a “revelation”! Yet the peak of flaring for Solar Cycle 23 still lay two and a half years in the future, and flaring would be sustained well into 2007. Over that time hundreds of flares and ejection events would be logged in an extraordinary adventure of daytime astronomy. The flaring of SC23 was probably the strongest for a century – and was followed, unexpectedly, by the deepest minimum for a century – prompting NASA to denounce the sun for “behaving unpredictably”! Solar cycle SC24 is now well advanced, and GOES Class X flares (the strongest) erupted early in 2011; so activity is increasing. This, together with the fact that H-alpha equipment has never been cheaper, means that right now is the ideal time to enter the bizarre world of H-alpha astronomy. There is more to be seen than you’d dare imagine. Making a start: equipment and techniques. Some H-alpha features and how to recognise them. The coming maximum, what to expect. Solar magnetism and the reversal of polar fields. Growing up in Adelaide during the 1950’s and 60’s, a time of intense solar activity, Harry has the sun “in his veins”. His first sun images were projected with a small ‘scope, and then a larger reflector in the 1960’s, with regular viewing over following decades. In 2000 he began daily recording of sunspots in white-light. In 2001 he upgraded his 8” ‘scope by fitting an H-alpha filter, taking his first steps into the bizarre world of high temperature plasmas, flares and ejections. Observing in Sydney (often all day) he found that such events happen many times daily during solar maximum – and has since then recorded hundreds of flares and associated events. In 2006 he adapted a freeware product to pin-point H-alpha transients on the sun– a crucial tool for serious research. These efforts led to many articles in amateur journals as well as presentations to amateur groups and public gatherings. His favourite astronomical moment was following an ejecting filament from the sun’s surface to a point in space more than one solar radius away; material shown to be moving at ~300 km.sec-1! Affiliations: Sydney City Skywatchers, the Astronomical Society of NSW, the Royal Astronomical Society of NZ and the Astronomical Society of Coonabarabran. Objective: to better communicate the dramatic and paradoxical character of our star and its high velocity transients. Has the rain stopped? It didn’t even rain at Easter (except in Sydney somewhere, and Melbourne of course). Cool dry evenings and the end of daylight savings mean you can get out observing quite early. The lack of dust and moisture in the air make observing conditions excellent, while the lack of heat means turbulence is minimal. If you can brave the cold, the next six months are the best time of year for amateur observers. So, what’s happening? Firstly don’t forget there is a Transit of Venus on June 6th. If anyone wants to get some advice about observing the Sun safely please contact me on markab@westnet.com.au More immediately the best planet for us to view is beautiful Saturn. Saturn transits the meridian on April 16th (due north at local midnight) and is rising around sunset. As such, Saturn is perfectly placed for viewing throughout the night. With a modest telescope and medium magnification you should be able to see the shadow of the rings on the planet and perhaps even the dark ring dividing the two bright rings known eloquently as the A ring and B ring. Who says astronomers have no imagination? This is known as the Cassini division after its discovery in 1675 by Giovanni Domenico Cassini. The rings can even be seen in 10x binoculars if they are mounted on a tripod or held steadily. Saturn has five moons that may be seen in progressively larger telescopes but even binoculars will allow us to find Titan, which is actually the largest of all moons in the solar system, having a diameter of 5,152 klms. Saturn resides in the constellation Virgo for all of 2012 and is currently just north of the 1st magnitude star Spica, αVirginis. Spica will appear quite white and Saturn very yellow. There are few other bright stars in this area but Mars is just over the border in Leo near the bright star Regulus. Mars will appear a rusty orange colour and Regulus more yellow-white. Regulus marks the resting foreleg of Leo, the mythical Lion. Mars is actually shining brighter than Saturn but is quite small. I would be interested to hear of anyone perceiving any detail on this enigmatic planet. Above we see an image of the entire galaxy field in Leo taken by my friend Bob Price from Bethanga, in Victoria. Six galaxies appear in total with one unnamed. M95 is in the bottom right of the image with the SN showing just below to the right and some glare from nearby Mars bleeding into the pixels from the right. This SN and galaxy is easily visible in a 150mm telescope and Leo is currently in our north, about 35° up the sky. Although they are the natural result of the end of life cycle of a massive star, supernovae are relatively rare. Only three are known to have occurred in our Milky Way in the last 1000 or so years. The first occurred in Taurus and was recorded by Chinese and Middle Eastern astronomers around 1054 A.D. It’s remnant is the famous Crab Nebula, M1. The next was discovered and observed in 1572 by the Danish Astronomer Tycho Brahe, in the constellation Cassiopeia, it became known as Tycho’s Star. The most recent was SN 1987a in the Large Magellanic Cloud (strictly speaking not in our galaxy but in our galactic neighbourhood). It was actually discovered by radio astronomers, three hours ahead of being discovered visually, simultaneously in Chile and New Zealand. It is now a brilliant planetary nebula with the typical hourglass shape created by the expanding rings of gas shown end on. not a visual spectacle that excites the imagination of the general populace the way a Total Solar Eclipse does, it is an event that holds great significance for us all. Firstly, it is a truly rare event. Transits of Venus occur in pairs eight years apart but then do not recur for 105.5 years and on the next cycle 121.5 years. Total Solar Eclipses occur at the rate of three every two years. Few people alive to see this transit will see another. Transits of Venus were unknown until Johannes Kepler, the great planetary mathematician, predicted an occurrence on December 6th, 1631. Venus appears as a small round black dot when crossing the face of the Sun, invisible to the naked eye. As Galileo had turned the newly invented telescope on the heavens for the first time in 1609 it had never been observed before. Due to a small error in parallax mathematics Kepler did not predict the second of the transit pair occurring eight years later but it was independently predicted and observed by English amateur Jeremiah Horrocks on 4 December 1639. As he was not well known and did not publicise his calculations it is believed he and his friend were the only two people on the planet to see this one. In the eighteenth century, advances in telescope design and instrumentation continued at breakneck speed. Planetary positions and orbits were plotted more accurately and predictions could be mathematically refined. Around this time we see the great nations of Europe exploring the world by sea for trade riches and power. The Spanish, French, English, Dutch and Portuguese had been sending explorers to all corners of the globe for a hundred years. Enormous riches and influence, not to mention new territories to claim, were the spoils for the adventurous, however many of these explorers and crew perished because they became lost. Unable to accurately ascertain their longitude they could miss their target by many miles or hundreds of miles, running out of water and food or becoming becalmed in unknown waters. It was easy to find your latitude, simply measure the angle of the Sun above your horizon at local noon but to find your longitude was more difficult. The story of the search for the best method is brilliantly told by Dava Sobel in her book Longitude. If a navigator could know accurately the time at a given point on the globe, say Greenwich or Paris, he could compare it to noon at the meridian of his location. Every hour difference was equal to 15 degrees of longitude. Many solutions were proposed but ultimately those who had accurate timepieces, unaffected by temperature, barometric pressure or the motion of a ship, would be the most astute navigators. The chronometer and its use for accurately plotting one’s position was obviously a momentous advance for mankind but what has it got to do with the Transit of Venus? As you will see both our own history and the development of astronomy are connected by this event. After observing a transit of Mercury in 1677, the brilliant English astronomer, Sir Edmund Halley, proposed that the next transit of Venus could be used to determine the distance of Venus from the Sun, and by simple trigonometry the distance from Earth to the Sun. Why was this important to astronomy? Astronomers had noticed that some stars, when measured at different times of the year, appeared to move slightly against the background stars. They had known of this effect for quite some time as the superior planets (outside Earth’s orbit) would appear to move in reverse against the stellar background for a short period when Earth went past them in its own orbit. This effect was known as parallax. See the diagram below. By checking a stars position at six monthly intervals an astronomer would be measuring the baseline of a triangle the diameter of Earth’s orbit or twice the length of the Earth – Sun distance. Knowing that distance accurately meant the parallax distance to some stars and perhaps measurement of the scale of the visible universe would be within their grasp. Halley proposed to use a smaller measure of parallax to find this Venus-Sun/ Earth-Sun distance. He posited that two observers timing the Transit from distant locations on Earth could create a long enough baseline using parallax measures to create a heoretical angle from Earth through Venus to the Sun. Johannes Kepler, who formulated the three Laws of Planetary Motion, had also calculated, with his third Law, the ratio of a planets distance from the Sun compared to the time taken for its orbit. Kepler had proven that the ratio of Venus’ distance to the Sun compared to Earth was 0.72. By multiplying the apparent Venus /Sun angle by 0.72 we arrive at the Earth/Sun angle. Let’s not worry about the actual equation here but remember we have now worked out the angle and the length of one side of our triangle (the distance between our observers on Earth) and we can use our High School maths (remember Sine, Cos and Tan?) to calculate the distance accurately. This method is the same as used by all surveyors to determine distance with a theodolite. chronometer to calculate his longitude, but no Transit to time on this occasion. This chronometer cost £400 or approximately £59,000 in today’s currency. When all the timing, positional, and angular measures were calculated the results from the earlier Transit of 1761 and those of 1769 gave a figure for the Earth/Sun distance that only varied from our modern measure by about 3%. Inaccuracies crept in because of poor seeing, poor timing, poor calculation of locations, and an anomalous effect of the Transit known as the Black Drop that made it difficult to see the exact second the planet entered or exited the disc of the Sun. Around a century later in 1874 and 1882, the research was conducted primarily with the new technique of photography but was again slightly marred by the discovery that Venus had an atmosphere which generated further inaccuracies in timings. So, is the event rare? It certainly is! Is it an immense and wondrous spectacle? Perhaps only when you consider the implications. Does it have a profound effect on mankind? The event itself, perhaps not, but the observation generated an enormous tide of activity in the affairs of men. It pressured advances in technology, navigation, timekeeping, measurement and the science of Astronomy. Is it personally significant? To us, who will not see another, it may be. If you have an inkling of the history it must affect you. Personally, it is one of many aspects of the Universe above our Earth that astonish and compel me.